Do you have a dream? Perhaps you dream to be a published author. Perhaps you dream to be a personal coach or maybe your dream is to own six mansions in six different cities in the world.Maybe you want to lose weight. Perhaps you want a perfect body with six pack abs. Or maybe you want better health, a better job. All of us have some desires, some dreams. We're only human. And as humans do, we talk about them to our closest friends or our family, the ones with whom we feel most comfortable. A thing that I have noticed is that very often, the first reaction of the person you share your dreams/desires with is that they will point out the reasons why it cannot be done, or why it is a bad idea. They will , in nine cases out of ten, play the devil's advocate. Maybe they think that they are being realistic here by pointing out the pitfalls in your plans (if you have made them) or telling you why it is difficult to realise (if it is a pipe-dream). They may be trying to protect you, out of their extreme love for you, or they may genuinely believe that it is truly not possible. We, being human, tend to give a lot of weightage to the opinions of those immediately surrounding us. Our deep inherent (and perhaps subconscious) need for 'approval' and 'love' makes us tend to agree with the flaws that they point out. After all, they are only giving voice to that niggling doubt you had deep inside,but had ignored or pushed aside, being brave enough to share your dream/pipe-dream. I can vouch for a fact that if you badly want something and if you act on it, no matter what others say, it is very much possible to achieve it. This is exactly what Rhonda Byrne emphasises in 'The secret'. This is what Esther and Jerry Hicks keep repeating over and over in their numerous books and workshops. The power of human mind is indeed astonishing. You can read this post of mine which is about the power of believing. It has the very inspiring story of Graham Miles who suffered from a Brain stem stroke and whom the doctors said would never recover. The doctors have no explanation for this, as it was a case of 'locked in syndrome' and most people die within a few months. One trick that I have learnt to make your dreams come true, is never to share it with anyone who is likely to express even the slightest amount of negativity. You want to lose 10 kilos? You can! You want to train to run for a marathon? You really can! Don't let anyone tell you otherwise.Hug your dreams to yourself but pursue them quietly. It does require consistent hard work, discipline, dedication. It may be difficult, but certainly it is not impossible. Do not believe anyone who says that you cannot. Stay away from well meaning people who say "You are being too ambitious." What they are capable of, and what you are capable of is very different. To them, it may seem so. They are judging you by their yardsticks which may not be applicable to you at all, even if they happen to be people who know you well. In Feb 2007, it was a pipe dream for me, just to see my name in print. (let alone be a published author which seemed so far fetched!) I remember how delighted and over-joyed I was, when I first saw my name in print on an article I wrote for a local newspaper. I went on to write for Times of India and Readers Digest.I had no idea at that time, that I would really become a published author and that too of a National best-seller (which sold more than 24000 copies and still counting! ). Also, it had been a pipe-dream for me, for many years, to be able to create realistic portraits. I never knew that would come true as well and I never knew people would consider me good enough to commission me. Yes, I did work hard. But more than that I knew better than to listen to the nay-sayers. I had my fair share of them and I still come across them. But now I have made myself immune to what the discourager says. When someone tells me that I am being too ambitious or someone tells me "Oh--but that is impossible', it only makes me more determined to chase it harder. Because I know something that they don't-- Nelson Mandela's words. "It only seems impossible till it is done." 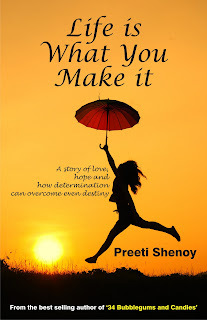 PS: My second book 'Life is what you make it' which will be out in stores by 25th Feb, can now be pre-ordered with a cash on delivery option! You can also read the synopsis and join discussions on the Facebook page. Very true...yet i think our minds are so much tuned according to what others say and it gets difficult to change it to what we actually want. Its ofcourse huge amount of hardwork to make it believe what we really want. Congratulations Preeti!....You have achieved a lot and pursued your dreams to the fullest!....and above all inspired many! To me, there is no other way to live if we don't constantly work on fulfilling our dreams. I accept advice only when it comes from someone who is where I want to be. It has helped me avoid quite a few naysayers (or 'drains' :P). again, good luck with the 2nd book! The very essence of what you have said is what i felt when i read "The Alchemist". If you really want something and work towards it,nothing is impossible. Caterpillar: i am excited too! Sundari: Alchemist is a book I loved. It is essentially what all the 'think positive' books say. Life begins: true--but one should just tune out. Thanks! Oh my,,,how I LOVE that book cover! 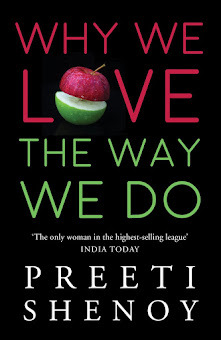 inspiring, Preeti as always..I feel the main obstacle in achieving anything is yourself. like you said, half the time we get easily discouraged, and many times, i think the reason for that could be that it is not wished for that fervently. Thank you very much for your regular dosage of encouragement! It definitely pushes me forward when I feel down or when I start questioning myself "Can I do it?". Though I have never heard you speak, I seriously feel that you can be a very good motivational speaker. One post from you fills me with so energy and brings life to many of my dreams. Hi Preeti- I live in the US. Where can I get hold of a copy of ur first book? I whole heartedly agree with you :). The book cover is simply lovely.. I too believe that keeping an +ve attitude always while chasing dreams may help you to reach far beyond your dreams too. Absolutely preeti, We achieve if we believe in ourselves rather than believe others. nice motivating post. Pia Vinay: yes I am good at public speaking :) Those who came for my first book launch have heard me speak.Thanks so much for your generous comments! Preethi - You make me fall in love with your blogs everytime I read them.. awesome piece yet again.. Thank you! Such an inspiring post! That too when I needed it the most. I am preparing for one of the hardest certification at work and everyone around keeps saying that I can not do it within the time frame I have set . Thanks to you , now I know I can. Completely agree with you Preeti..very well written post!In hypnotherapy we believe that a thought is the root/base for everything. So if u plant a negative thought in subconscious, even before u pursue anything it'll be dead. So planting positive thoughts is so impt! They say, u are what u think u are...so it gets even more impt to be surrounded by ppl who are positive! Congrats & Good luck with your 2nd book..looking fwd to it! That is a wonderful post! And it is so great to hear about your second book.All the very best for you. And the cover design of the book itself is very lively. I have pre ordered my copy and I am looking forward to the results of the discussion board at FB. if I get lucky---god!! 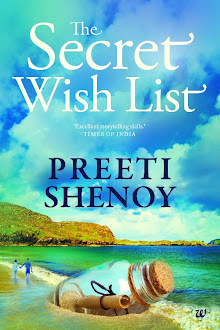 I will be the honored owner of "3" preeti shenoy book! !